logo done by OptoFluff :: send your logos to us and be a popstar ! No NFO file because I'm lazy, but here is some tech info. A more detailed writeup may come when I recovered my normal sleep schedule and fixed Shinra website. 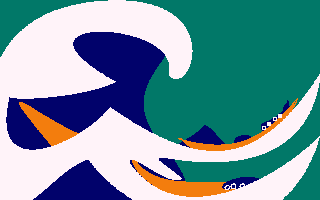 So, the idea was to fit Hokusai's The Great Wave off Kanagawa in 1K. I worked from an SVG file and removed a lot of details until it would fit the allocated space (packed with zx7). Eventually it ended up too small after some late minute changes to the code which improved the compression. Oh well. So in this form we need only 3 multiplications. The computations are done using CPC firmware which provides neat floating point math support. I compute 256 points along each curve (this could be adjusted to less points for faster drawing, at the cost of slightly less smooth curves) and draw lines between them. Then the system FILL routine is used to fill the closed shapes. The sound of waves and thunder you can hear is just the Y or X coordinate (I don't remember, whichever sounded best) sent to the AY noise register (again using the CPC firmware, because this is the most space efficient way). I tried to write some music using the free bytes left but did not manage to do anything very convincing. Next time I'll try to spend more effort on the sound side. I enjoy procedural generation stuff ! CPC needs more procedural GFX. page created in 0.017693 seconds with 15 queries.